Dine Out at Your Pie Nov 6th! 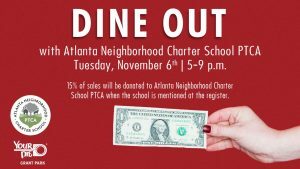 DINE OUT with Atlanta Neighborhood Charter School PTCA Tuesday, November 6th, 5-9 p.m. 15% of sales will be donated to Atlanta Neighborhood Charter School PTCA when the school is mentioned at the register. The PTCA sponsors a variety of education enrichment activities for students throughout the year and hosts various informative events, fundraisers, and social gatherings.